We’re setting up a new team to work in government and beyond to increase the digital skills of the UK. 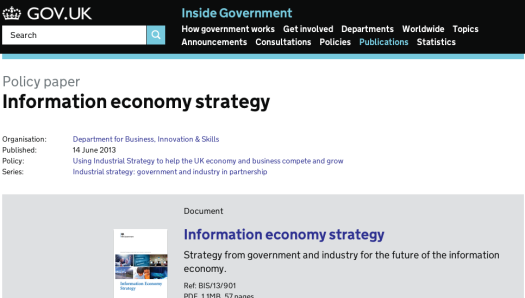 Today the Department for Business Innovation and Skills released the Information Economy Industrial Strategy (IEIS) to boost growth opportunities for digital industries. It includes something I’ve been working on with departments for a few months - setting up a new cross-government team that will be based in GDS to co-ordinate work on digital skills for citizens and businesses. The work of the team will be developed collaboratively with colleagues across government, but I’m writing this post to tell you more about why we’re putting it together and what it will do. The Government Digital Strategy sets out how central government is going to transform its services to become digital by default. But we’re aware that 18% of adults in the UK are not online and many others are online but don’t have basic digital skills. That’s why digital by default services will have assisted digital support so that people who aren’t online can use them. But we want as many people and businesses as possible to get the benefits of being online. Government already makes a substantial contribution to this, not least - as the IEIS sets out - working with Martha Lane Fox’s Go ON UK and funding UK Online Centres. We can have a greater impact by coordinating this work - inside government and with the wider public sector, the private sector, and the voluntary and community sector. Another reason that we need to coordinate is that digital skills are relevant to so many areas of government activity and there are lots of parts of government talking to the same users. Digital infrastructure, welfare reform and of course digital services all have digital skills elements - we can have more impact if we work together. So the most important thing for me about this team is that it is formed through contributions from government departments as well as GDS. Our thanks go to the departments who will be lending staff and contributing funding - and working closely with the team in the coming months. What will the team do? The team is going to focus on three areas of work. Firstly, it is going to develop a strategy for digital skills activity in central government. Departments will take their lead from this strategy, which will be closely linked with other public, private and voluntary and community sector work on digital inclusion. As I mentioned above, and in keeping with the way we developed the Government Digital Strategy, this will be developed collaboratively across government and focused on doing things, rather than just talking about them. Secondly, the team will provide leadership by acting as a central point for collaboration with partners to take forward digital skills projects, and by working with departments to build digital skills into their policy development. Thirdly, the team will develop and own the evidence base on ‘what works’ in digital inclusion, and use this to plan future activity. In everything it does, the team will work closely alongside Martha Lane Fox, Go ON UK and its partners, who are already at work to make the UK the world’s most digitally skilled nation. We’re busy getting bums on seats in the team and they will introduce themselves here soon. Your comments are very welcome - either below or via our feedback form. As with all our work, we rely on external participation and review to challenge and improve what we do. I have enjoyed reading about the new digital inclusion team. You mention that the private sector would take a part in helping to implement the Government Digital Strategy. To what extent will the private sector help? I would like to know if the private sector will provide the information communication technology and the training support that will be needed. Digital inclusion has become a topic close to my heart of recent and I am very much looking forward to participating and contributing where possible.